I remember in the 1990's when the first genome of an organism was mapped out. It was a pretty big deal. It wasn't much later the whole human genome was mapped. DNA sequencing and genotyping continues to get faster and cheaper. Genotyping, determining the specific genetic variants a person possesses, has become cheap enough to draw curiosity seekers in. Many companies now provide ancestry analysis. Spit in a tube, and for a hundred bucks we'll tell you how many hundreds of years ago that 0.5% Mongolian entered the blood line. Or no, you really don't have Native American DNA. Hundreds of thousands have pursued this curiosity now. Some companies offer much more for additional cost. 23andMe has a traits and wellness option that looks at numerous traits. The normal, obvious stuff, like eye color, but also less obvious stuff like sensitivity to caffeine and sleep habits. 23andMe nailed these last two for me. I tend towards heavier caffeine consumption than average coffee drinkers and I am not a deep sleeper. These DNA traits do not play well together and thus I really should curb or suspend caffeine consumption. A couple tests that 23andMe performed came with a warning and an opt-in or opt-out. These are early onset Alzheimer's and Parkinson's Disease. Some people may not want to know they are going to go batty at an early age. There is also the issue that once you know this information, it could be treated as a pre-existing condition for insurance purposes and you could be denied coverage or forced to pay a much higher premium. I opted to not be told the results of these two tests for now, a decision I can change later if I want. The raw data is there. I already know my ancestry going back many generations (northwest European). I could care less if my DNA says I can tell my pee smells funny after eating asparagus. Yes, this is one of the tests. Everybody's pee smells funny, but I had no idea some people are genetically incapable of detecting this. I sure can. So why did I plunk down some cash for this silliness? I recently learned 23andMe checks the so-called "sprint gene." The gene is called ACTN3, and variants of it code muscle composition. Anecdotal evidence for a long time has suggested I'm a fast twitcher. I was never curious enough to find out for sure by getting a muscle biopsy. Carve a piece of my quad out? No thanks! Spitting in a tube seemed much easier and less painful. It is ironic that I have fast twitch traits yet shun activities where fast twitch prevails. I'm thinking stick and ball sports, track, or even criterium races in cycling. I like the long distance endurance activities, such as multi-hour bike and ski races. I tend to ride and train with other athletes that are stronger than I in endurance efforts. I can out-gun them in a 5-30 minute effort, but go past a few hours, I get buried. Another indication I'm fast-twitched is in caloric consumption. I eat much more than my presumably slow-twitched companions. We go on trips, weigh about the same, do the same rides burning the same calories, yet I replenish with far more calories and still lose weight. Fast twitch muscle is much less efficient in producing power than slow twitch. I feel a bit cursed in this regard, but some of my friends feel cursed with slow twitch. 23andMe makes your full, raw data available online. 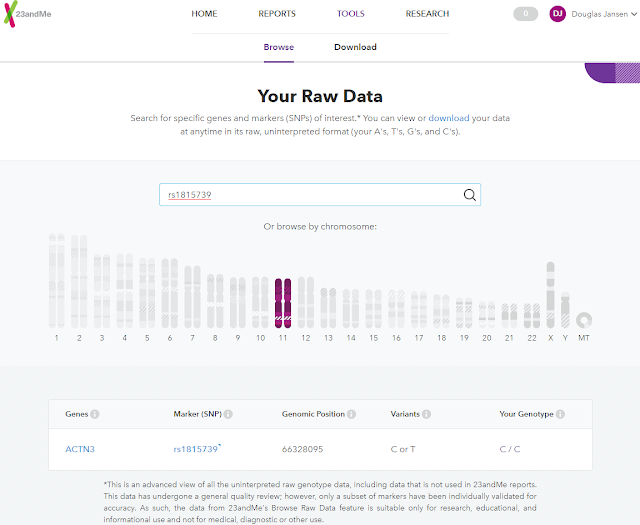 You can browse by gene name, by traits or even chromosome. Scary how much info is there. They don't sequence your entire genome, only parts of interest, but still a huge amount of data. I have C/C, two working copies. Doubly blessed (or cursed) with fast twitch! So what does this mean? It's not rare. Nearly 30% of those from European descent inherit C/C. Some areas of Africa see closer to 100% of this genotype represented. That phrase "white men can't jump," well, there's a genetic basis for it right here in this gene, the fast twitch gene. What is rare, however, is somebody with no working copies, the T/T variant, reaching high levels of competition in sprint or power type competition. You must have this gene to climb that last couple percent in performance to compete at a world-class level. So going forward, does this change anything for me? No, not really. I'm not about to start weight training and racing crits. I already know I don't excel in several hour long events. One of the side benefits of possessing the C/C genotype is that muscle tissue with this protein is more resistant to breakdown from abuse. I now understand better why my body seems to tolerate weeks upon weeks of junky volume better than others. I will continue to engage in activities that are fun, clear the head and provide a balanced fitness.